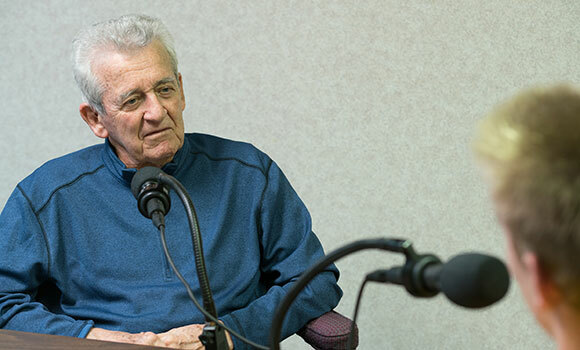 UNCG junior James Bredon interviews Korean War veteran Sam Tomlin. UNCG’s Dr. Chuck Bolton believes that everyone has an important story that needs to be told. One of the signature offerings of UNCG’s War & Peace Imagined event series, “Oral History and the Veterans’ Experience” is designed as both a course for UNCG honors students and a community project. This unique collaboration provides students and community members the opportunity to work together and collect the stories of individuals who have been impacted by war – from veterans to conscientious objectors to refugees fleeing conflict. 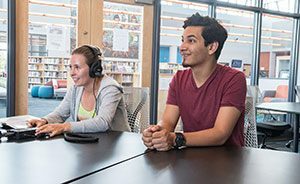 UNCG students Ola Noras (left) and Beyrim Louhichi (right) participate in StoryCorps training in September at the Greensboro Public Library. In September, StoryCorps traveled to Greensboro to train the 17 students and nine community members participating in the project. Since then, participants have interviewed “storytellers” from a variety of backgrounds. As a StoryCorps project, the interviews will be archived in the Library of Congress in Washington, D.C., as well as in the Greensboro Public Library. 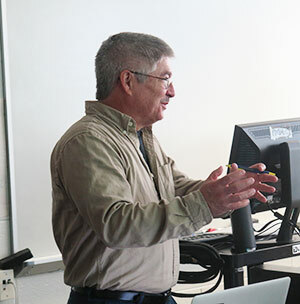 Over the course of the semester, students have learned oral history theory, interviewing techniques and listening skills. Junior James Bredon was interested in taking the course because his grandfather is a Korean War veteran. Sophomore Alyssa Sanchez was familiar with StoryCorps through its weekly broadcast on NPR and jumped at the opportunity to work with the organization. “It’s been fascinating to gain a behind-the-scenes look at the production side of StoryCorps,” she said. Why is it important to collect the stories of war? According to Bolton, military conflict is nearly universal. “Throughout history, warfare has impacted so many different populations,” he said, adding that the project is also an opportunity to collect some of the last remaining stories from World War II veterans. The course will culminate in a final project for students. Additionally, Bolton and the Greensboro Public Library will present several story sharing sessions to the public on Feb. 9 and March 9. For Bolton and his students, the project is a perfect example of history’s importance and relevance today.